R|61} Study of Japanese Porcelain, enclosed in wickerwork. M.
Rapid study for a first practice in colour. 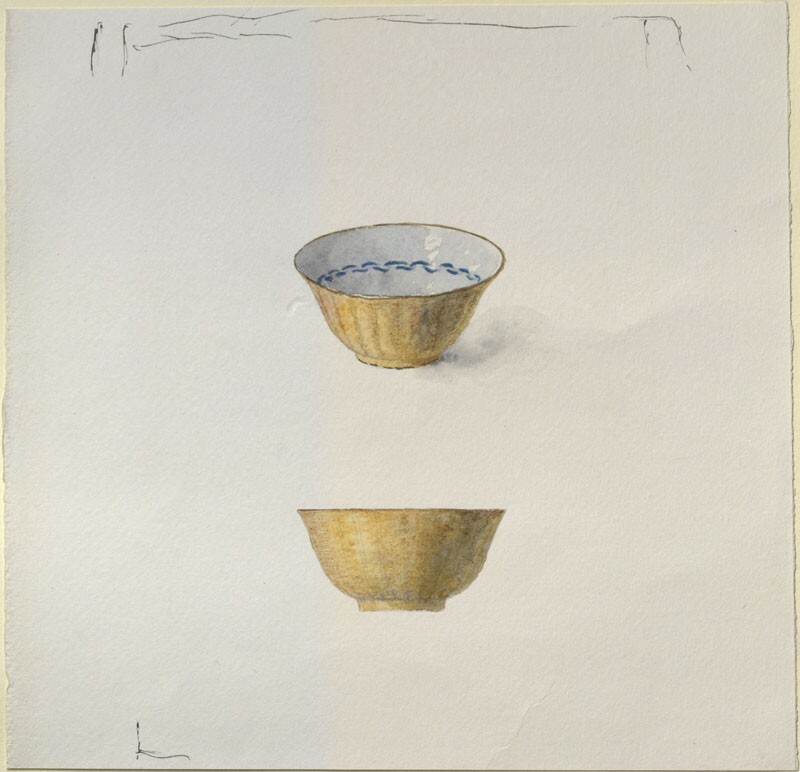 Each drawing is to be carefully, but lightly, outlined in pencil first, and then executed with one wash touched while it is wet, doing as much as is possible on those terms - that is to say, the blue inside of the cup is to be done with one coat of very wet grey-blue, leavR. ing the high lights with sharp edge and putting a little black before the coat is dry into it for shadow. The brown outside is to be done with one coat of brown, putting yellow and grey into it as it dries. As soon as it is quite dry nothing more is to be done to it. When the inner coat is quite dry, the blue pattern is to be put upon it with sig single touches of the brush, and the dark lip to be done last, with the few darkest touches at the bottom. The lower figure is to be done in the same manner, all with one wash; except the dark lip which is to be done when the rest is dry.